Epipremnum aureum – Devil’s Ivy or Golden Pothos. Is this the easiest indoor plant of all time, if its not, Devil’s Ivy is very close to whatever wins. It has great foliage all year round, tolerates low light with no problems and you can even forget to water it for a while and it will thrive. The leaves are heart shaped, waxy and glossy and a good green and gold combination. It grows on long trailing stems and it also is regarded as one of the best air purifying plants. The botanical name is Epipremnum aureum, and if you want to know why it is called Devil’s Ivy, this common name comes from the fact that its very difficult to kill. In fact it will stay green even if grown in very dark rooms. The first time we saw this plant was growing in a restaurant, low light and less than ideal conditions, it was thriving. It is often grown up a pole or totem and this works well in containers. Use it a a clumping plant indoors, or outdoors in a position protected from the cold. For the best look, place Devil’s Ivy in a position where it does get good filtered light, in very dark areas it will lose the variation in the foliage. This is one tough plant, it takes very little care and will reward you with good foliage year round. Use a good quality potting mix with added fertiliser. Water when the soil begins to dry. Any general purpose liquid fertiliser will do. The time to fertilise is in spring, every three weeks, right through to the end of summer. The best time to prune Devil’s Ivy is in summer, however it can be trimmed at any time if needed. Every now and then it is best to prune the stems back so that they reshoot, this prevents long bare stems. Although you can grow cutting in water, they are usually better if they are propagated in potting mix . The best time to take cuttings is in spring. 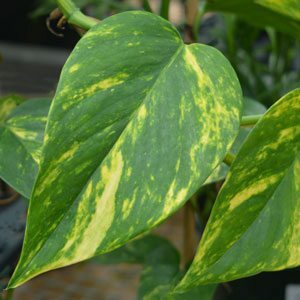 Common Names – Devil’s Ivy or Golden Pothos. Position – Low light to brighter filtered light. The more light, the better the variation in the foliage. Spread – Will spread to around 3 metres. Foliage – Mid to deep green splashed with yellow. Flowering Time – Mainly in spring, although it will flower through the year..